Bob Bernstein is the founder and managing CEO of eSeats.com. Many many years ago when Bob was just 14 years old his father took him and his twin brother Mike out to the Phoenix Suns game at the Veterans Memorial Coliseum, better known as the Madhouse on McDowell in central Phoenix. Armed with a pocket of singles and five dollar bills Bob and Mike began what would become a lifelong passion in the area of ticket brokering. Over the next 30 years the Bernstein brothers have helped over 50,000 sports and entertainment fans secure the most sought after tickets to both national and international events. The ticket business has helped Bob and Mike travel the world and earn real world ticketing experience that will come in handy when it’s your turn to be a consumer of premium tickets. The purpose of The Ticket Blog is to educate and advise ticket buyers when buying premium event tickets while avoiding some of the common pitfalls. We will also include announcements about upcoming events which may appeal to our readers. 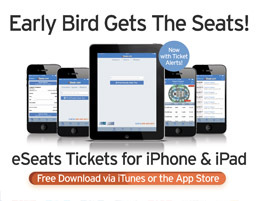 eSeats.com is a privately owned online ticket agency based in beautiful Scottsdale, Arizona. eSeats.com is a member in good standing with the Better Business Bureau of Arizona and the (NATB) National Association of Ticket Brokers, organized to promote the highest level of ethics in the secondary ticketing marketplace. 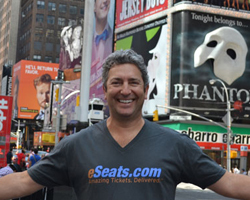 eSeats.com has been helping companies and individuals obtain tickets to premium, high-demand and sold-out events since 1978. Our sister company owned and operated by Mike Bernstein called Championship Tennis Tours is a leader in the Tennis Travel industry and has served thousands of satisfied clients with ticket and tour packages to Tennis’ major events since 1987. Because of our strategic alliances with a wide network of ticket agencies throughout the US, Europe, UK, Asia and Japan, we are able to obtain the best seats to the most sought after concert, sports and theatre events. We look forward to working with you and taking care of your ticketing needs.